I’ve met dozens of celebrities , business leaders, and multi-millionaires over the years. Many of them, such as Eric Trump and Steve Wozniak are my very good friends now. If you want to connect with rich and powerful tycoons and celebrities, first impressions count. But what do you say? How do you act? What’s your best approach for expanding your relational capital? Watch and learn exactly how to handle introducing yourself in this revealing video of me meeting famed rock star Bret Michaels for the first time ever last year. No editing. No rehearsals. This is the real deal. The cameras were rolling and captured every moment of our first conversation. Watch it right now. See for yourself how our conversation unfolded. Pay close attention to how we greet each other and quickly find common ground. Learn from my experience how you should handle yourself when meeting anyone, whether famous or not. 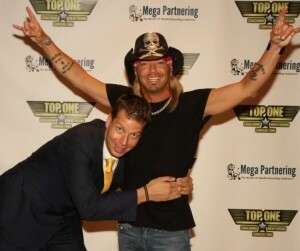 What I like about Bret Michaels isn’t just that he’s a revered rock legend or Celebrity Apprentice winner, but that he’s a warm genuine person. He truly cares about his fellow human beings. In fact, I originally met Bret because of my connection with Eric Trump and his work for St. Jude’s Children’s Hospital. Take a front row seat as you see how I use my networking skills to establish rapport. Watch as we discuss Bret’s passions in life – his music, his family, and his spirit of giving back to the community. I won’t spoil the surprise for you, but if you don’t learn at least three important lessons on how to connect with the wealthy and famous, I’m sorry, you’re just not paying attention. As I often say, your network equals your net worth. So if you want to enjoy success in life, watch this video now. It will really help you make the most of your time if you’re attending Mega Partnering later this month.